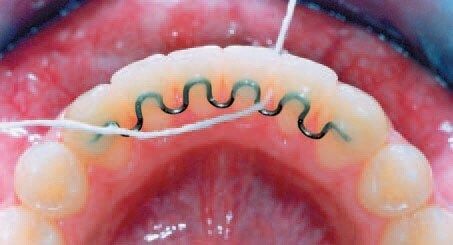 Permanent wires behind teeth make flossing difficult - what can I do? Hi, I have a question, I’ve recently had braces and now have permanent wires behind my teeth, this makes flossing difficult, is there a solution for this as I feel like I get a build up of plaque that I can no longer access? Thanks, Adam. Dear Adam, Retention is very important after orthodontic treatment. You have removable and fixed options for retainers and sometimes both. The normal fixed straight wire can stop floss from going down between teeth and make it harder to keep a good oral hygiene. You should still be able to fit something like a small interdental brush through if not there might be glue stuck from when the retainer was fitted. Have you had oral hygiene instructions in how to clean around the retainer? If not make an appointment with your dentist or hygienist to arrange for this to happen. An electric toothbrush is always the best option to keep the fixed retainers clean.